Joe Books LTD, 9781772751970, 250pp. During just another day for the God of Thunder, Thor is defending Asgard against invading trolls when the unthinkable happens—his hammer, Mjolnir, loses its enchantment, depleting Thor's strength. Thor is still more than a match for his enemies; after vanquishing them, he learns the secret to his sudden weakness: Mjolnir has been switched! And only one being is cunning enough to carry out such a trick: Thor's own adopted brother, Loki. 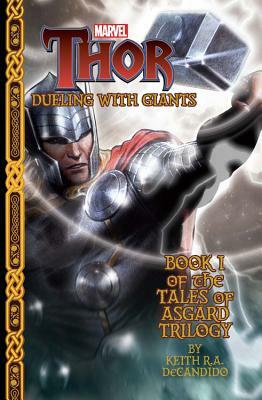 Dueling with Giants will be followed by two more riveting installments featuring Sif and the Warriors Three, all written by Marvel veteran and popular fantasy author Keith R.A. DeCandido. The Tales of Asgard Trilogy will be an adventure that Marvel readers won't soon forget.